Compilation and comment by Tom Hannan: Ex Federal Secretary (Sadly Tom passed away in 2012, after a short illness). The union was registered in 1906 as the Australasian Federated Butchers Union and the name was changed in 1912 to the Australasian Meat Industry Employees Union.Whilst this is still the official name in 2002 we are better known as the ‘Meatworkers Union’. In between 1906 and 1920 some states, in particular Queensland, were organised by American activists known as the International Workers of the World.They encouraged workers to set up boards of control on each of the jobs. These boards of control were very strong in North Queensland and were able to get very good conditions and also controlled production levels by whatever means were available.The sheds became so well organised that they reached agreement with the employers that the union office supplied all labour to the employer. Preference of Employment shall be given to members of the Queensland branch of the Australasian Meat Industry Employees’ Union, provided that the members so employed are competent workmen and do their work to the satisfaction of the Management. The union undertakes to the best of its ability to supply the Management of each works with all workmen required. In the event of the Union not being able within a time to be mutually agreed upon, to supply workmen required, the Management may engage such workmen elsewhere. Foremen shall have the right to place the employees in their departments in their respective positions, and may also dispense with the services of any employee or employees for incompetence, drunkenness, or unsatisfactory work. In cases of emergency, the Management may transfer employees, (other than those on tally rates) from one department to another, provided that should such employees be found unsuitable in the latter department they shall be retransferred to the former one. How much would unions like to have a clause like that in their award or agreement today! Did it work? In return for the grant of preference of employment, the unions undertake to supply the management of each works with all the labour required. The unions have, in fact, supplied that labour. Five thousand men are annually employed in the industry, and the supply of that labour, in work seasonal in its nature and subject to great fluctuations from year to year and in different parts of the State, has been a task of magnitude, for the performance of which the unions may well claim credit. The industry has been most successful, and towards this success the unions have in large measure contributed. While protesting bitterly against the number of ‘undesirables’ foisted upon them, the companies readily admitted the advantages of this arrangement. Meatworkers today generally do their bit for charity donating to medical research, children’s hospitals and other community functions. In the early 1900’s not much was different when meatworkers put huge emphasis on community affairs and established ambulance, hospital and fire services. Schools, the arts and libraries were also established. As you read through this history many of you will recognise the delegate structures that were in place in early 1900 and are still around and working today. Having read the history of your union thus far, members must be wondering how long it will take to get back to where we started in 1906. It is our intent to update the history pages of the website on a regular basis. If you have any pictures or information, please contact the NSW Branch on 1800 451 535 or email us. In 1907 the NSW Government established the State Abattoir on the Home Bush estate. Situated on what was then the western edge of Sydney, the Homebush abattoir was the major supplier of meat for the domestic and overseas markets until it was closed in 1988. At its peak, the abattoir employed 1,600 people and slaughtered more than 20,000 animals daily. The Olympic Stadium is built on the site of the former abattoir saleyards. The photographs on this page are taken from a publication by the Department of Labour and National Service, Australian Meatworks. Some Aspects of Personnel Practice and Working Conditions, Bulletin No. 10, 1946. The first meatworks was established in 1878 on 2,300 acres by Benjamin Richards. Because of a lack of refrigeration,killing of beef took place at night. By 1879 a mutton house had been completed. 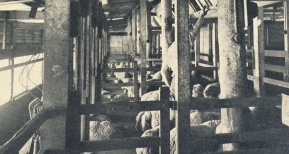 By 1893 an average of 2,000 sheep and 100 cattle were being processed daily. The meatworks was purchased by William Angliss in 1919 and the meatworks was expanded with the construction of freezers, a cannery and an area to treat sheepskins. In 1934 the Vestey group of companies took over the works. A new meat works complex was constructed in 1973, making Riverstone one of the most modern and technologically advanced meat processing plants of the day. By 1978 over 2,000 people were employed in the meatworks. By 1981 rumours of the meatworks closing down were being heard and in 1984 a three day working week was introduced, closely followed by the total shutdown of the abattoir. Smorgon Consolidated Industries bought the meatworks in 1992 but the meatworks was again closed, this time permanently in 1994. The plant and equipment has been broken up and sold off.